I would like to continue where I left off from my previous post about beans; it is significant that a simple eating habit such as eating a cup of beans can help us lower our cholesterol levels, but also maintain our blood sugar levels as well as help us lose weight since beans are filling due to the fiber and protein. And let’s not forget the antioxidants. Here in Greece we are in the holy week, the last week before Easter. While traditionally the religious fast starts about 40 days before Easter, most Greeks nowadays will not be fasting for all those days, however the majority of Greeks still fast (avoid animal products with the exception of some seafood) the week before Easter, so it seemed fitting to share this easy bean recipe. I do not eat all that many soups, I prefer beans thicker. An easy way to get tasty beans is to sauté them in a bit of olive oil and then warm them in tomato once they are boiled. They are very tasty and you can add any vegetables you like. I often steam the beans rather than boil them. In fact an Israeli study from a few years ago, showed that steaming chickpeas helps retain more antioxidants. You can try steaming them for about the same amount of time you would boil them. 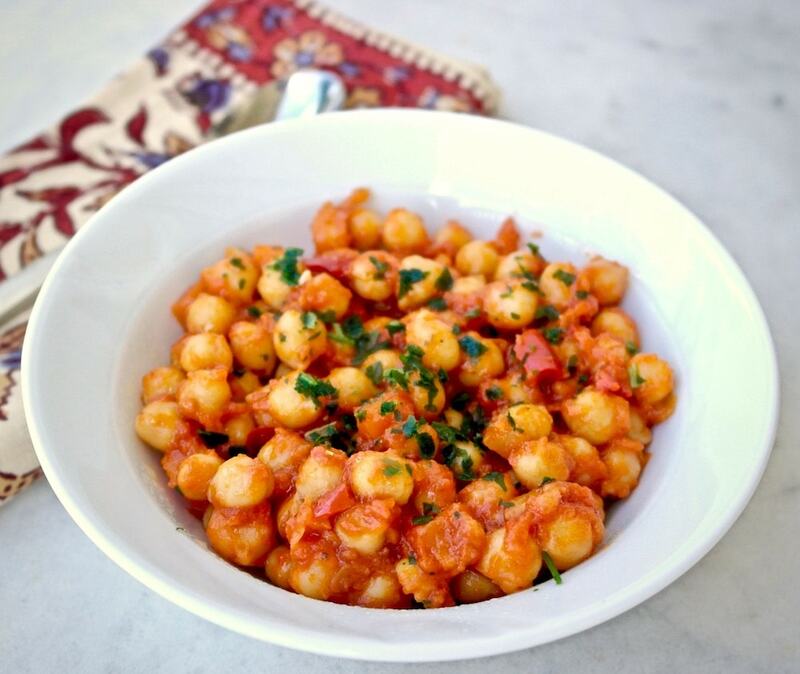 Here is my version for chickpeas, but you can do it with other beans as well. If you are using dry soak chickpeas overnight. If you are using dry chickpeas rinse and put in a pot, add water so the beans are covered by about 3 inches and the bay leaf. Cook for about an hour until the beans are soft. Half way through cooking add the chopped onion, pepper and carrot. If you are using canned chickpeas, you can just boil the carrots, pepper and onion for about 20 minutes and drain. Once the chickpeas are cooked, drain them along with the other vegetables and set aside. In a pan heat the olive oil, and sauté the chickpea mixture for a few minutes. Add the tomato sauce and sugar and mix well and let it simmer for about 15 minutes until all liquids has been absorbed. You can add small amounts of hot water if needed during the cooking. Remove from heat. Add salt and pepper and sprinkle with some parsley. 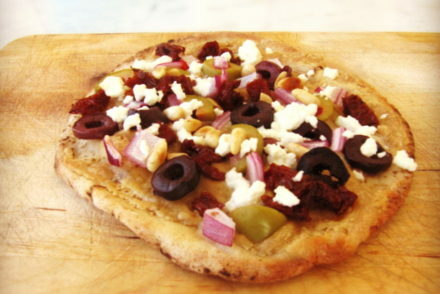 Enjoy this as is, with a slice of bread or with a piece of feta cheese if you are eating dairy. Like the chick pea recipe, my personal favourite along these lines is fassoulada. Ideal for a cold winter evenings together a simple side salad, and most importantly, a freshly baked crusty baguette. These types food are basically peasant foods and more often than not better than what can get in overpriced gourmet restaurants. In my travels around the world I have eaten in many of these establishments and on many occasions I’ve had better hospital food!Homemade, regional food can never be beaten. Thanks Yanni. Definitely, it may be considered peasant food by some, but it has also been proven as one of the healthiest eating patterns. I’m surprised you boil the vegetables since that tends to remove more nutrition. Is there any reason (regarding the taste) that I might not want to just sauté the veggies in a little olive oil prior to adding the other ingredients? Love your site. I’m from the deep south (US) and love to cook. People think of southern food as being very high fat, but like the Greeks, there has been a change in the South. My Mom grew up on a farm, they ate small amounts of meat and lots of veggies. Pork fat was used in “limited” amounts to add flavor, so the unhealthy fat was not used in large quantities. Then they worked as field hands, so the physical activity was a large factor. 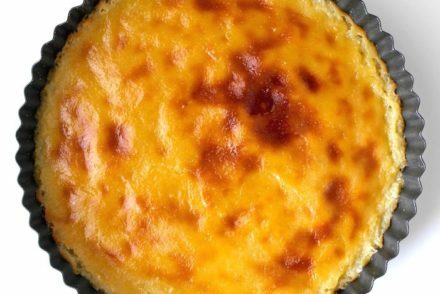 In the current era mayo, cheese, and sugar dominate the so-called southern favorites. These were not used much in the old South–they cost money which was in short supply. They grew veggies, raised hogs, milled their own cornmeal, and the sweets were sorghum syrup or honey–which was in limited supply and a special treat. 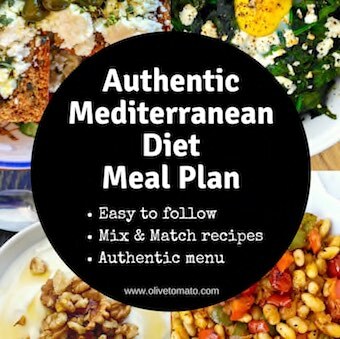 I am very fond of southern cuisine (although I would like to experience it more) and I believe there are a lot of similarities with the mediterranean diet. For the vegetables, they need to be cooked somewhat otherwise if you just saute them they will not cook enough and will be crunchy (which is not what you want in this particular dish). Having said that, I usually steam them rather than boil them as they do retain a bit more vitamins. Do you have a recipe for Fasoula? It is similar to the above recipe. I live in Ontario, Canada and visit St. Jacob’s Market and purchase it from an Egyptian family. Thank you. Hello. Can’t wait to make this. I have cut out all white sugar and white flour from my diet so is it okay to leave out the tsp. 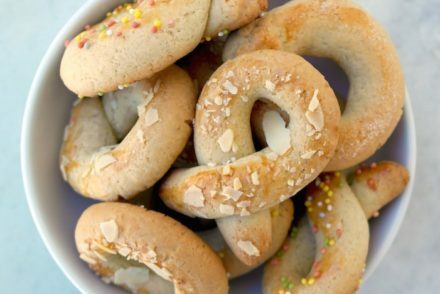 of sugar from this recipe? Or do you suggest using stevia etc? So I made this for lunch and served it on quinoa and added a side salad. OMGOSH!!! This is my new favorite dish. I loved it so much I ate it for dinner also. (AND I left out the sugar) Thank you for the awesome recipe. also do you have a serving size recommendation and possibly a carb count? Love this website. I also am from the south and have noted the difference in how my grandfather (b.1921) grew up eating and how most people eat today or what people think of as traditional southern food. He kept a journal from age five until he died a few years ago and he always wrote about his food. But a personal story. My father and mother both were diagnosed with high cholesterol and with high of the bad type cholesterol. All they started doing was eating beans, doubled their veggie intake, and drink one glass of red wine a day with no medication and they both now have superb cholesterol. Both are near 60 and the doctors were stunned by what diet did for them without medication. That is great! It is so important to always try lifestyle changes before using medication. Elena, I made this for the third or fourth time tonight. Such a great recipe! My mother grew up on Kalymnos and makes a similar dish. The chickpeas are boiled while in a separate pan a large sweet onion is slowly sautéed, first alone then with some tomato. The dish is finished by baking the chickpeas slowly for a long time with a branch of rosemary. I love your recipes! They are so simple, foolproof and healthy. Just the type of food I love to prepare, and eat. Thanks Maria! I will try your mom’s recipe soon! Lovely recipe Elena … thank you.